The newest NSA leak has just been posted at the Guardian and it gives credence to Snowden's earlier claim the he could, "from his desk," wiretap nearly anyone in the world. US officials, including NSA apologist/CISPA architect/Internet hater Mike Rogers, denied Snowden's claim, with Rogers going so far as to call the former NSA contractor a liar. The documents leaked today seem to indicate otherwise. A top secret National Security Agency program allows analysts to search with no prior authorization through vast databases containing emails, online chats and the browsing histories of millions of individuals, according to documents provided by whistleblower Edward Snowden. The NSA boasts in training materials that the program, called XKeyscore, is its "widest-reaching" system for developing intelligence from the internet. [T]raining materials for XKeyscore detail how analysts can use it and other systems to mine enormous agency databases by filling in a simple on-screen form giving only a broad justification for the search. The request is not reviewed by a court or any NSA personnel before it is processed. XKeyscore utilizes a variety of plugins to allow searches, including email addresses, phone numbers, IP addresses, full logs of every DNI session and machine-specific cookies. This gives agents an advantage other surveillance programs don't. The purpose of XKeyscore is to allow analysts to search the metadata as well as the content of emails and other internet activity, such as browser history, even when there is no known email account (a "selector" in NSA parlance) associated with the individual being targeted. Analysts can also search by name, telephone number, IP address, keywords, the language in which the internet activity was conducted or the type of browser used. One document notes that this is because "strong selection [search by email address] itself gives us only a very limited capability" because "a large amount of time spent on the web is performing actions that are anonymous." The slides warn that the data collected will be too large to parse (or even store for a great length of time). It recommends harvesting first and "selecting" second, in order to refine the results (using a "Strong Selector"). Agents are directed to look for "anomalous events," some of which seem a bit troubling. These "anomalies" are common enough that plenty of non-terrorists will be getting a second look from agents utilizing this program. And again we see the NSA's instant distrust of anyone using encryption. This is one of the hazards of "collecting it all" and then working backwards. It's easy to make common behavior look suspicious if you start at an end assumption and connect the dots in reverse. Also troubling are some of the suggested applications of the search program shown in the slide deck, including "show me all the VPNs startups in Country X" and "show me all exploitable machines in Country X." On top of this, there's the sheer breadth of the program. The quantity of communications accessible through programs such as XKeyscore is staggeringly large. One NSA report from 2007 estimated that there were 850bn "call events" collected and stored in the NSA databases, and close to 150bn internet records. Each day, the document says, 1-2bn records were added. The XKeyscore system is continuously collecting so much internet data that it can be stored only for short periods of time. Content remains on the system for only three to five days, while metadata is stored for 30 days. One document explains: "At some sites, the amount of data we receive per day (20+ terabytes) can only be stored for as little as 24 hours." Because of the massive size of the data haul, metadata is retained and stored longer while more specific data is released. 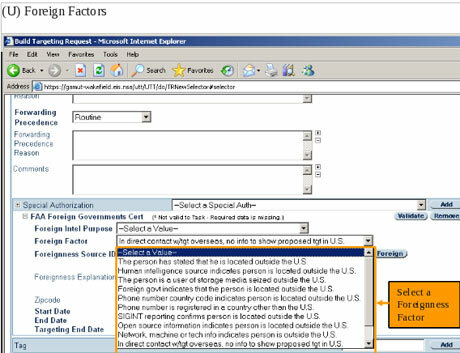 This still allows agents to perform broad searches to gather as much data as possible while relying on the stored metadata to put other connections together. Once they have the connections, the shallow search can be better utilized with the "strong selectors." The data harvested isn't solely relegated to foreign communications, no matter what the pulldown menu says. The power of the database pretty much guarantees the inadvertent collection of data on American citizens. This is exacerbated by the fact that some web traffic will be indeterminate in origin or termination. This leads to violations of the few laws that do pertain to NSA data collection, something the NSA documents admit is a problem. Of course, as Snowden pointed out, there's always a solution. In recent years, the NSA has attempted to segregate exclusively domestic US communications in separate databases. But even NSA documents acknowledge that such efforts are imperfect, as even purely domestic communications can travel on foreign systems, and NSA tools are sometimes unable to identify the national origins of communications. Moreover, all communications between Americans and someone on foreign soil are included in the same databases as foreign-to-foreign communications, making them readily searchable without warrants. Some searches conducted by NSA analysts are periodically reviewed by their supervisors within the NSA. "It's very rare to be questioned on our searches," Snowden told the Guardian in June, "and even when we are, it's usually along the lines of: 'let's bulk up the justification'." Speaking of "justification," the slides claim that over 300 terrorists have been caught using XKeyscore. And the NSA has responded to the Guardian's leak with the usual claims that everything here is legal and audited, etc., which, again, doesn't make it right or even constitutional. It just makes it what it is: the end result of more than a decade's worth of expansion, secret law interpretations and compliant administrations. I worked for a major competitor of Cisco and they did not have anything in the software that secretly allowed for general monitoring. There have been numerous instances of routers from various companies (including Cisco) having backdoors installed without the knowledge of the software devs and most of the hardware engineers.